SKA to be world's largest radio telescope. More than 250 scientists and engineers from 18 countries and nearly 100 institutions, universities and industry will design the SKA, which is expected to provide new insights into gravity, dark energy, the formation of the universe and the possible existence of alien life. “This multi-disciplinary team of experts has three full years to come up with the best technological solutions for the final design of the telescope, so we can start tendering for construction of the first phase in 2017 as planned,” said SKA Board chairman, John Womersley. The total work, which has been divided into 11 parts, has been valued at $170 million. Australian industry and research institutes will participate in seven of the eleven work packages, with the ICRAR directly involved in three. The Australian bodies that won contracts include the CSIRO, the International Centre for Radio Astronomy Research (ICRAR), Swinburne University, Aurecon Australia, Cisco Australia, RPC Technologies and AARNet. “These leading Australian organisations are set to propel Australia’s science capacity beyond its already impressive standard through skills development, technological invention and international collaboration,” said Australian SKA director, Brian Boyle. CSIRO will lead the dish design consortium where it will continue to develop its phased array feed receiver for wide field of view radio astronomy. CSIRO will also lead the Infrastructure Australia Consortium and is involved in the assembly, integration and verification work package. Cisco and AARNet will work on signal and data transport. Aurecon will work on infrastructure technical studies and design and costing work required to prepare the Australian SKA Phase 1 site for construction. The ICRAR will help design the SKA’s science data processor, central signal processor and the low frequency aperture array for SKA-low, the part of the SKA that will be located in Australia. Cisco and Swinburne University will also work on the central signal processor. The ICRAR is also leading specialised infrastructure work for SKA-low, including solar power, signal transport and custom building design. “The astronomy community has moved into the next exciting phase of work towards the SKA,” ICRAR Director Professor Peter Quinn said in a statement. The ICRAR is a joint venture between Curtin University and the University of Western Australia. Launched in 2009, it is one of Australia’s largest training centres for graduate students in astronomical science and technology. In August, the WA government awarded the organisation $26 million in funding over the next five years. The science data processor under work at ICRAR will process the terabytes of data per second produced by the SKA’s antennas into information digestible by astronomers from around the world. The central signal processor is a specialised computing system that will combine signals from millions of SKA-low antennas into the format needed for the science data processor. 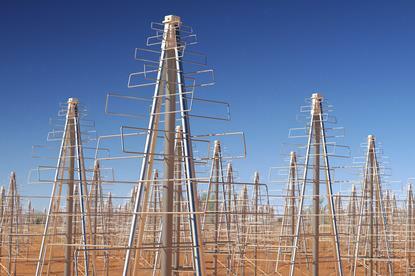 Work on the SKA site in Western Australia has already begun, the ICRAR said. A first-stage test array of new low frequency antennas is co-located with the Murchison Widefield Array, the SKA-low precursor telescope located near the Australian SKA site. The test array has already produced images that will help with the final design, it said. Last month, AARNet announced a new 8 Tbps fibre network in WA and South Australia that will be used in the SKA project. “This is a level of engagement only seen in revolutionary projects,” said Phil Diamond, director general of the SKA Organisation.